Hong Kong’s Ng On Yee defeated Maria Catalano 5-0 to complete the successful defence of her WLBS World Women’s Snooker Championship title and claim her third world crown overall on Saturday. On Yee completed a dominant week in Malta with a convincing victory against world number four Catalano, who earlier in the day had stunned 11-time world champion Reanne Evans with a 4-3 win to progress to her fifth world final and first since 2013. It was also a fifth final for On Yee, who last month became world number one for the first time in her career and following previous victories against Belgium’s Wendy Jans and third ranked Rebecca Kenna, routed Catalano to seal the title without the loss of a single frame. The success sees On Yee become only the third player ever to win the title on three or more occasions, joining an elite group comprising Reanne Evans (11), Allison Fisher (7), Kelly Fisher (5) and Karen Corr (3). The 27-year-old will also extend her lead at the top of the WLBS rankings when they are revised next week, while beaten finalist Catalano will rise one place to number three following her run. A delighted On Yee later revealed that she came into the tournament carrying an illness, but that this could have actually worked to her advantage. “I am absolutely over the moon to win my third title,” said On Yee. “I did not have great expectations coming into the tournament as I was coughing and sick so just tried to play every game, every ball. But looking back now I think that this took a lot of pressure off me and I started to play a little better. 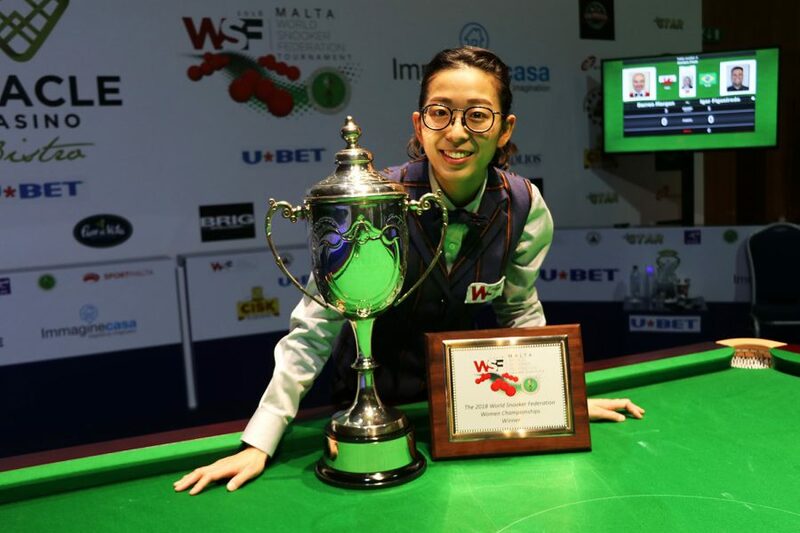 And having enjoyed her time at the tournament in Malta, the Asian star now turns her attention to Sheffield where she will compete at the professional World Championship qualifiers following her latest triumph. “It has been great to be here in Malta for the first time with very nice weather, a beautiful ocean view for breakfast in the morning and to be surrounded by nice people. “As well as the title, the most important thing for me is that I have now qualified to player at the professional World Championship in Sheffield which I am really looking forward to. The World Women’s Snooker Tour will return for its final event of the 2017/18 season with the Women’s Festival of Snooker, which runs from 13-16 April 2018. Entries for the event are still being accepted HERE.